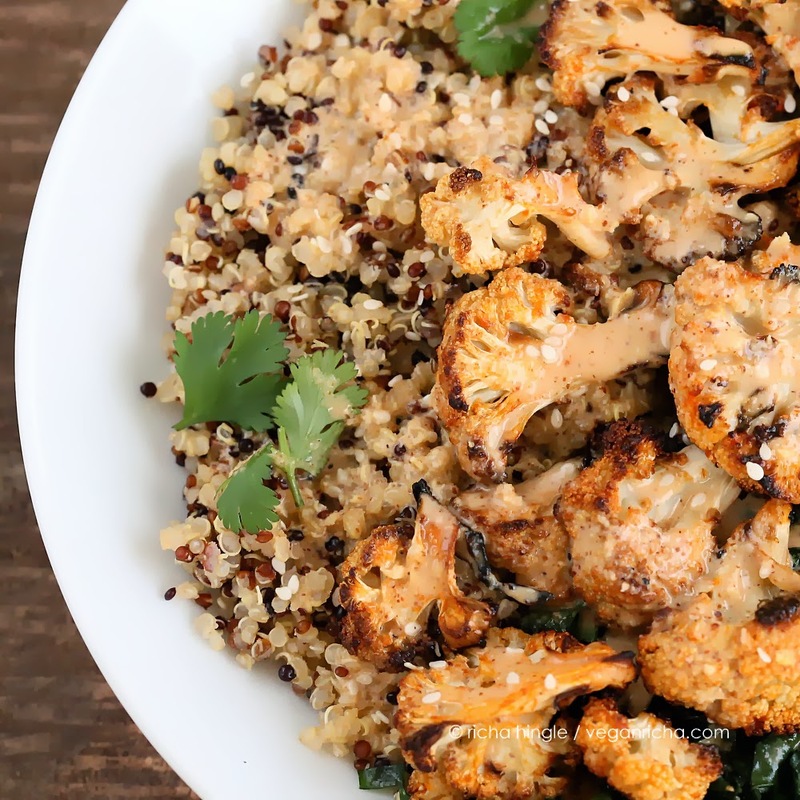 Roast the Cauliflower with Sriracha, cook the quinoa, saute greens, make the 8 ingredient Almond Butter Sriracha dressing and serve up a big helping! Free of Gluten, dairy, egg, corn. can be made soy-free. Ok, so its January. and everyone seems to be talking about cleanses, eating healthy and what not. And I am like, let me just stop some of that sugar craving that I picked up over the holidays and I am good to go. I think it is a bit easier for me and most Indians in general because we are more addicted to salt and spice! Savory food hell yes. Any which way, I digress. So quite a few times when someone asks me or hubbs about what they eat, they auto-complete their sentence to Salads. Which is quite odd, because both me and hubbs eat hearty salad mealsprobably once in a month. That is quite infrequent, no? Raw leafy greens is something I rarely enjoy in huge quantities. They just do not agree with my tummy. So this is what I do with them and the way I love them. 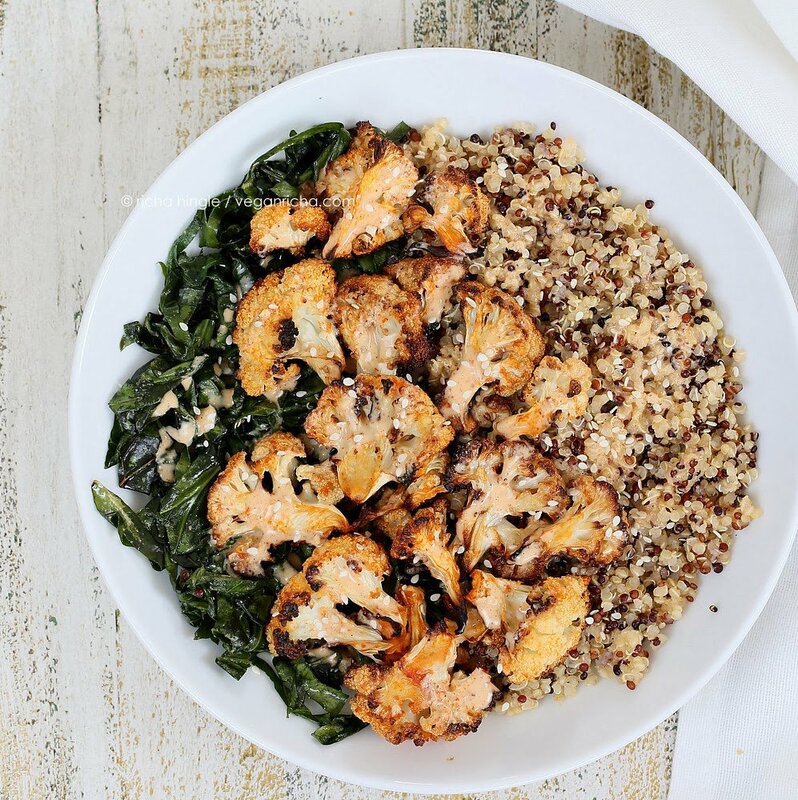 This delicious bowl of roasted cauliflower(croutons! ), grains or lentils(protein!) and lightly cooked greens is my idea of a salad. :) Oh yes, did I forget to mention Sriracha (Spice!) and almond butter sauce. When Jackie at Vegan Yack Attack asked me for a guest post for January and the theme was healthy and light, I thought I would do something on the lines of a salad. It is Janurary after all and I havent really posted salads or bowls in a while! This Mung Bean Sprout, Seared Carrots, Kale with chili Lime Dressing bowl, maple glazed tempeh salad, Asian bitter and sweet salad and Acorn, beet, satsuma salad. 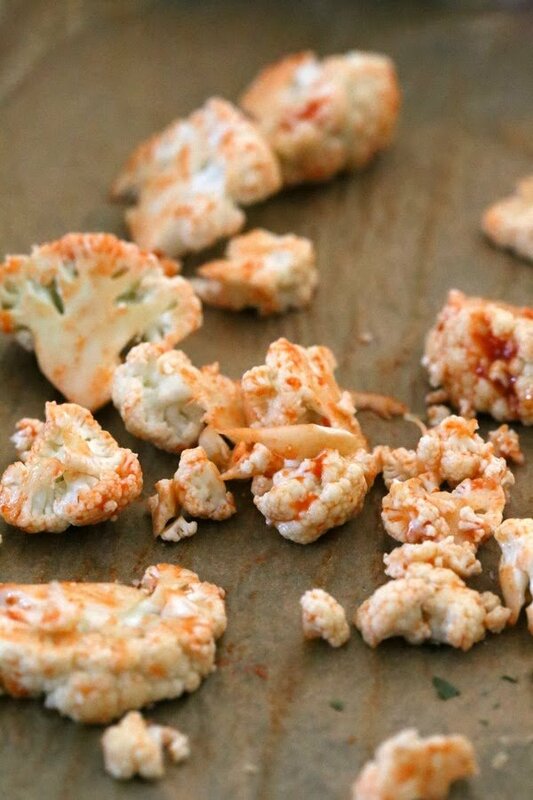 Toss the cauliflower in the Sriracha sesame oil and bake until golden. 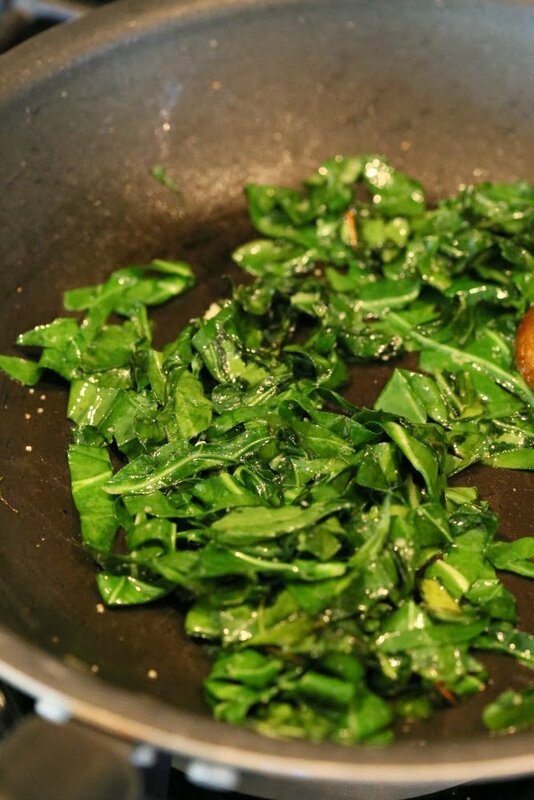 Saute the collard greens until tender. Add warm quinoa, cauliflower, collards to a bowl with a generous drizzle of the dressing and serve! Wash the quinoa then cook with the rest of the ingredients. Bring to a boil on medium heat then cook at low-medium heat partially covered 10-15 minutes. Fluff and keep ready. Or use 1 cup cooked quinoa or other grain or lentils. In a bowl, mix all the dressing ingredients. Toss the Cauliflower in it. sprinkle a bit of salt and bake at preheated 425 degrees F / 220ºc for 20-25 minutes. While the cauliflower roasts, heat oil in the pan on medium heat. Add the collard greens, salt and garlic and cook for a minute. Add the water, mix, cover and cook on low-medium heat until lightly wilted. Add all the ingredients to a blender. Blend well and use. Taste and adjust salt and spice. 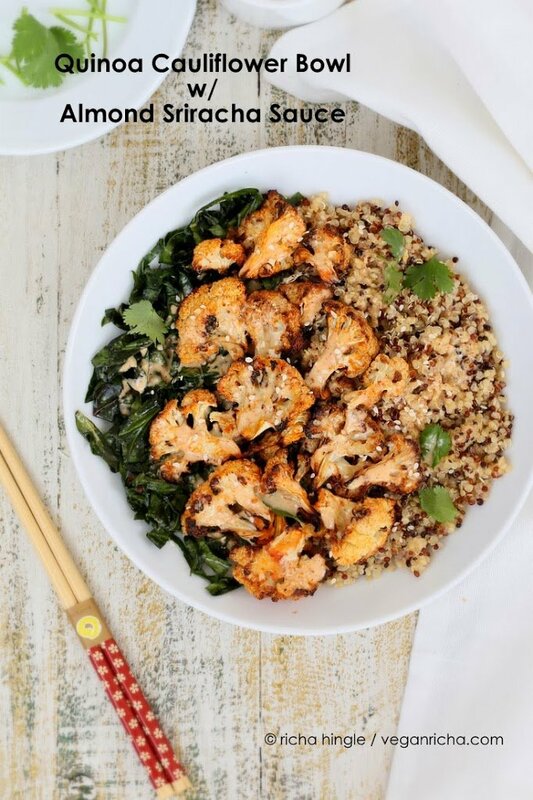 Arrange everything in a bowl and serve with a generous drizzle of the dressing, cilantro leaves and sesame seeds. This bowl sounds just perfect! I love the variety of flavors and textures, and like you, spice beats sweet any day of the week. Heading over to Jackie’s blog! if this isn’t a caitlin bowl, i don’t know what is. looks perfect in every way, lady. no need for cleanses, just simple, nourishing food. As a die hard cauliflower fan, I am in love with this bowl! Made this tonight & loved it! Thank you for the recipe, Richa. That looks amazinggg! I love cauliflower. LOVE THIS! I am not a fan of cauliflower but I figured, what the heck? And it tastes like an amazing, fancy Asian meal! Recommending this to EVERYONE! What is Sriracha Sauce (what is in it?) and where can I buy it? Thank you. its a type of asian hot sauce. it has chilies, garlic, vinegar, salt and sugar. there are some brands though that can have fish sauce. the original huy fong brand works well in the recipe. you can also use other garlic chili hot sauce. This recipe looked so good to me until I saw the nutritional value. 33g saturated fat? Is that a typo? I don’t really see where that amount of fat could come from (as well as 11g unsaturated). And I also see a burger recipe that sounds incredible and it has 2500 calories? 91g saturated fat? This is obviously not right. Are these charts valid? Where are you seeing those values? I can’t see them. If you see them on search results, it is probably the plugin or search engines that is adding those and they are incorrect. ah, some recipes use an older plugin. recipe card. that probably adds it. i have to change all to use easy recipe. in the meantime, thats not the right data 🙂 Thanks for letting me know. 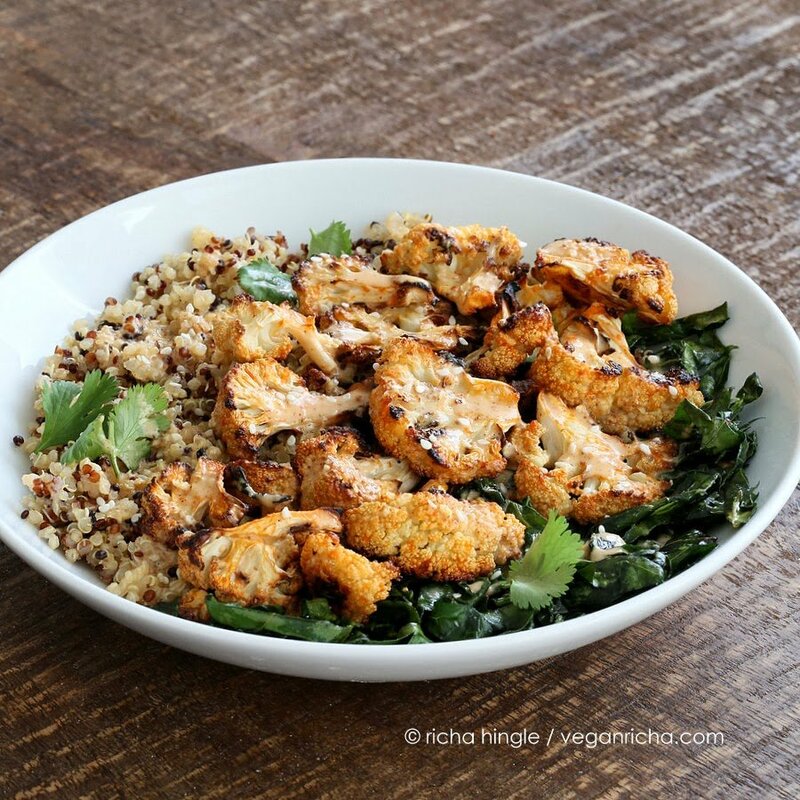 Holy quinoa bowl – this was amazing!! That sauce…wowza! We added green beans and sliced carrots to the bowl and one crushed garlic to the sauce. We went crazy and even added a little dill over the top. It was gorgeous! Thanks for another knocked it out of the park recipe!!! You knocked it out for sure! Your recipes have such brilliance that they are very forgiving of individual additions. The whole genius is not affected. Should have said that I have no idea if our sensibilities will work for anyone else. We can’t wait to try the Moroccan Chickpea Cauliflower Bowl with Herb Sauce with our newfound brown chickpeas (Kala Chana)! Woopwoop! I just made this today. The sauce is to die for I want to put it on everything. Hi Richa! I just wanted to let you know that this has been one of my go-to recipes for a few years now. This was one of the first recipes I tried when my husband and I decided to go vegan. We had no idea vegan food could be this tasty! This is one of his all time favorites and when I suggest it, you should see the way his eyes light up. I figured after all this time I should finally leave you a comment and let you know how much we love it and how much we appreciate what you do! We love all of your recipes! I am so happy to hear that!! Thank you for the wonderful note! Happy Cooking! Just made this for the first time, I did not have Siracha sauce, but found some Peri-peri sauce in the refrigerator and used that instead. Subbed Kale for the collard greens and added lemon juice to soften it. Turned out great! !